1 Java Programming (10155) Rationale Statement: The world is full of problems that need to be solved or that need a program to solve them faster. In computer, programming students will learn how to solve story problems and develop a computer program that will solve the problem. 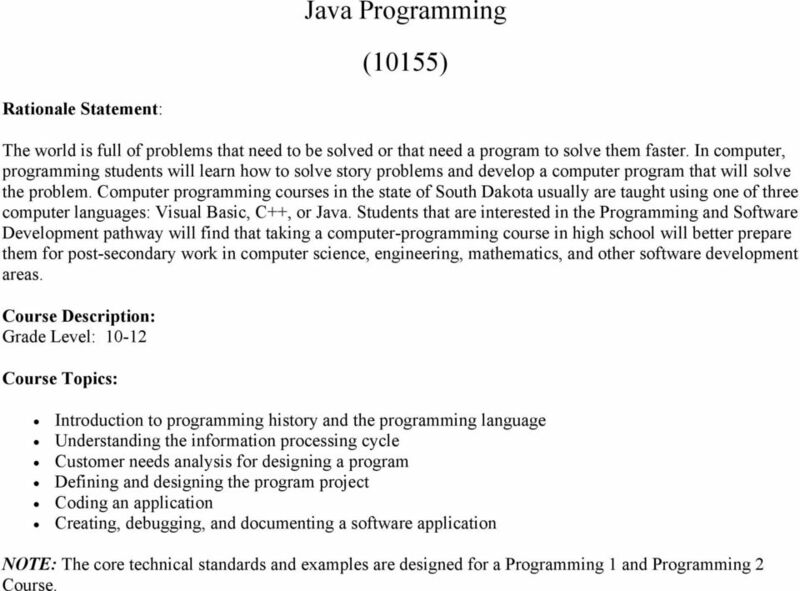 Computer programming courses in the state of South Dakota usually are taught using one of three computer languages: Visual Basic, C++, or Java. Students that are interested in the Programming and Software Development pathway will find that taking a computer-programming course in high school will better prepare them for post-secondary work in computer science, engineering, mathematics, and other software development areas. Course Description: Grade Level: Course Topics: Introduction to programming history and the programming language Understanding the information processing cycle Customer needs analysis for designing a program Defining and designing the program project Coding an application Creating, debugging, and documenting a software application NOTE: The core technical standards and examples are designed for a Programming 1 and Programming 2 Course. 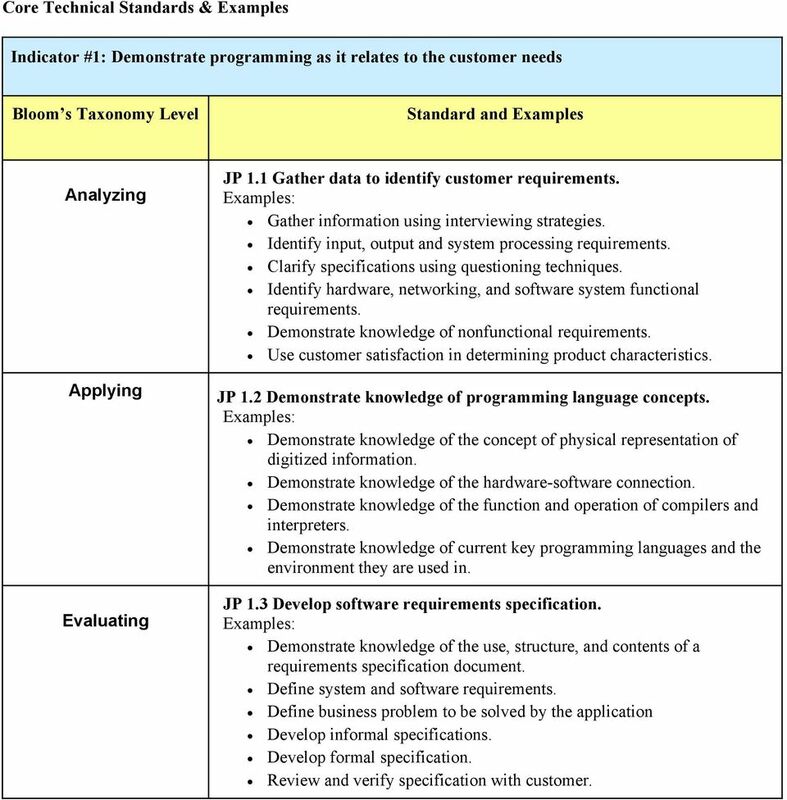 2 Core Technical Standards & Examples Indicator #1: Demonstrate programming as it relates to the customer needs Analyzing Evaluating JP 1.1 Gather data to identify customer requirements. Gather information using interviewing strategies. Identify input, output and system processing requirements. Clarify specifications using questioning techniques. Identify hardware, networking, and software system functional requirements. Demonstrate knowledge of nonfunctional requirements. Use customer satisfaction in determining product characteristics. JP 1.2 Demonstrate knowledge of programming language concepts. Demonstrate knowledge of the concept of physical representation of digitized information. Demonstrate knowledge of the hardware-software connection. Demonstrate knowledge of the function and operation of compilers and interpreters. Demonstrate knowledge of current key programming languages and the environment they are used in. JP 1.3 Develop software requirements specification. Demonstrate knowledge of the use, structure, and contents of a requirements specification document. Define system and software requirements. Define business problem to be solved by the application Develop informal specifications. Develop formal specification. Review and verify specification with customer. 3 Indicator #2: Produce IT-based strategies and project plans to solve the problem. Understanding JP 2.1 Define scope of work for the programming project. Demonstrate knowledge of the key functions and subsystems of the software product. Demonstrate knowledge of software development process and issues. Develop implementation plan. JP 2.2 Demonstrate knowledge and skills of working in a software development team. Identify resources and risks. Demonstrate knowledge of cross-functional team structures and team members roles. 4 Indicator #3: Demonstrate knowledge of the software development process. 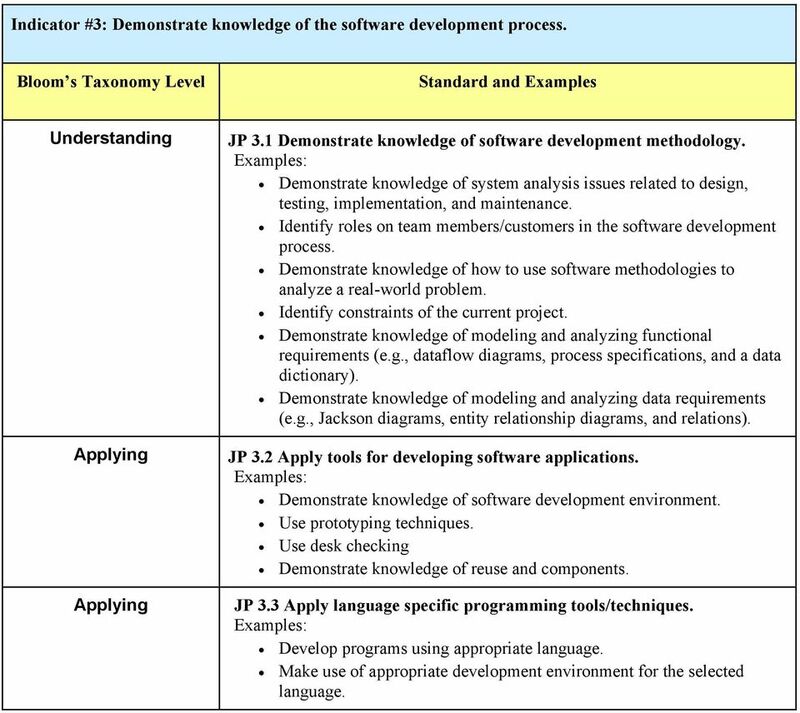 Understanding JP 3.1 Demonstrate knowledge of software development methodology. Demonstrate knowledge of system analysis issues related to design, testing, implementation, and maintenance. Identify roles on team members/customers in the software development process. Demonstrate knowledge of how to use software methodologies to analyze a real-world problem. Identify constraints of the current project. Demonstrate knowledge of modeling and analyzing functional requirements (e.g., dataflow diagrams, process specifications, and a data dictionary). Demonstrate knowledge of modeling and analyzing data requirements (e.g., Jackson diagrams, entity relationship diagrams, and relations). 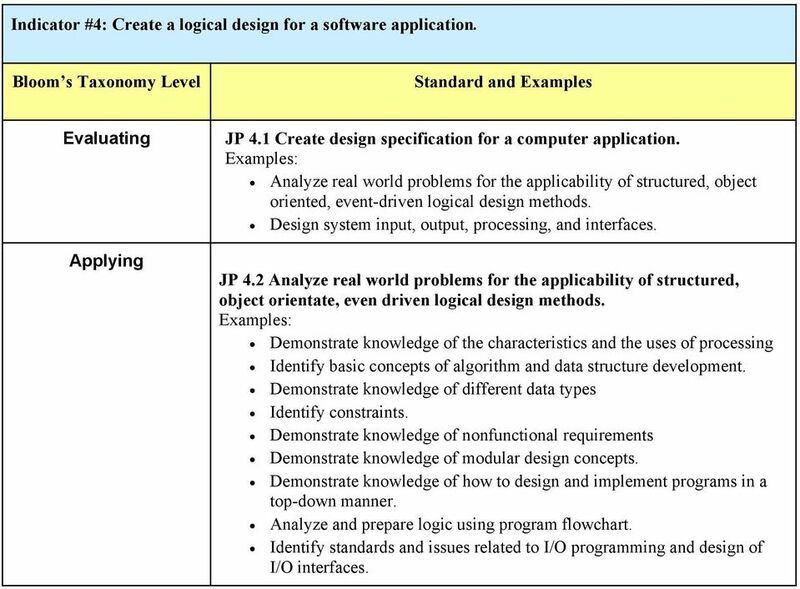 JP 3.2 Apply tools for developing software applications. Demonstrate knowledge of software development environment. Use prototyping techniques. Use desk checking Demonstrate knowledge of reuse and components. JP 3.3 Apply language specific programming tools/techniques. Develop programs using appropriate language. Make use of appropriate development environment for the selected language. 5 Indicator #4: Create a logical design for a software application. Evaluating JP 4.1 Create design specification for a computer application. Analyze real world problems for the applicability of structured, object oriented, event-driven logical design methods. Design system input, output, processing, and interfaces. JP 4.2 Analyze real world problems for the applicability of structured, object orientate, even driven logical design methods. Demonstrate knowledge of the characteristics and the uses of processing Identify basic concepts of algorithm and data structure development. Demonstrate knowledge of different data types Identify constraints. Demonstrate knowledge of nonfunctional requirements Demonstrate knowledge of modular design concepts. Demonstrate knowledge of how to design and implement programs in a top-down manner. Analyze and prepare logic using program flowchart. Identify standards and issues related to I/O programming and design of I/O interfaces. 6 Indicator #5: Create a computer application by writing code. 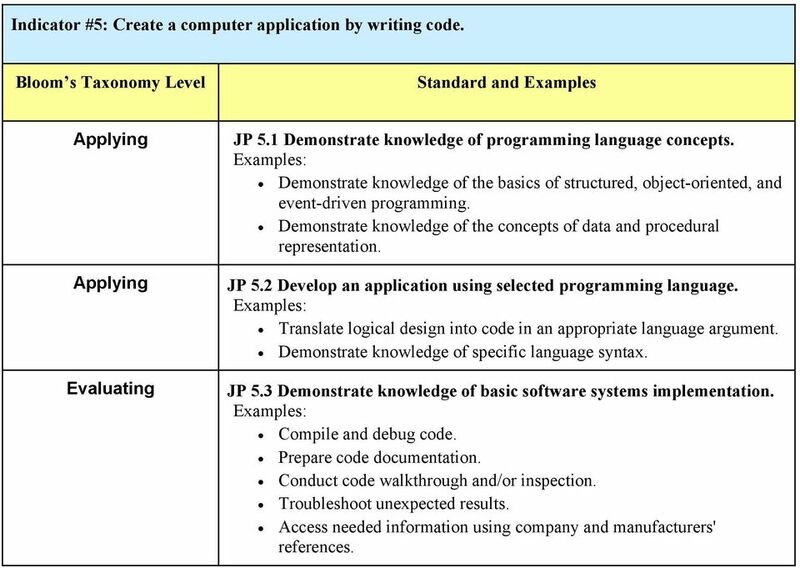 Evaluating JP 5.1 Demonstrate knowledge of programming language concepts. Demonstrate knowledge of the basics of structured, object-oriented, and event-driven programming. Demonstrate knowledge of the concepts of data and procedural representation. JP 5.2 Develop an application using selected programming language. Translate logical design into code in an appropriate language argument. Demonstrate knowledge of specific language syntax. JP 5.3 Demonstrate knowledge of basic software systems implementation. Compile and debug code. Prepare code documentation. Conduct code walkthrough and/or inspection. Troubleshoot unexpected results. Access needed information using company and manufacturers' references. What methods are used to conduct testing? El Dorado Union High School District Course of Study Information Page Course Title: ACE Computer Programming I (#494) Rationale: A continuum of courses, including advanced classes in technology is needed. (SDD) Template Software design is a process by which the software requirements are translated into a representation of software components, interfaces, and data necessary for the implementation phase. Systems Investigation and Analysis. Systems Development. What is it? Why Plan? C H A P T E R 12 Systems Investigation and Analysis Systems Development What is it? If you can t do it better, why do it? -Herbert H. Dow, Founder, Dow Chemical Company Why Plan? Why do we need a process? CHAPTER 1 ENGINEERING PROBLEM SOLVING. Copyright 2013 Pearson Education, Inc.
Issues and Guidelines of Software Design for Safety Critical Applications Jeffrey M. Fornoff US Army RDECOM-ARDEC Picatinny Arsenal, NJ 07806-5000 (973) 724-3014 1 Outline A Brief Overview - What is Software? TECH. Requirements. Why are requirements important? The Requirements Process REQUIREMENTS ELICITATION AND ANALYSIS. Requirements vs. REQUIREMENTS SPECIFICATION AND MANAGEMENT In this note we give the requirements process in a software organization, a template for the requirements document, and the process to manage changes to the requirements. Welcome to the National Instruments presentation of the Spartan-3E Starter Board as an academic learning platform.